When dressing and swaddling your newborn to keep her from getting cold, it's easy to get carried away. This can cause overheating, which is a serious threat to her health. The American Academy of Pediatrics has linked overheating to an increased risk of sudden infant death syndrome. The signs of overheating in a newborn are easy to detect. Touch your baby's head and collar area to check for dampness. A damp neck or head indicates that your child is sweaty. Look at your baby's face. If it is redder than usual or has a rash, your baby may be overheating. Listen to your child's breathing, or watch the rise and fall of her chest. Rapid breathing is a symptom of overheating. Feel your baby's chest to see if it feels hot, which is another sign that she is too warm. Note whether your newborn is unusually difficult to put to sleep and whether she does not stay asleep as long as normal. Restlessness is a possible sign of overheating. Be aware, however, that it is also a sign of several other problems, including being too cold. Do not base your conclusion only on restlessness. Look for the other signs. Unless the environment is cold, do not cover your baby's head after the first few days of birth, particularly during sleep. Babies lose most of their body heat through their heads, so covering a baby's head will trap too much heat inside her body. Do not overdress your newborn. You should dress your baby in as much clothing as you would find comfortable, plus one additional light layer, such as a thin sleeper. If you choose to share a bed with your baby -- a practice the American Academy of Pediatrics discourages, as it may increase your child's risk of sudden infant death syndrome -- do not use the extra layer, as your body heat will make your baby warmer. 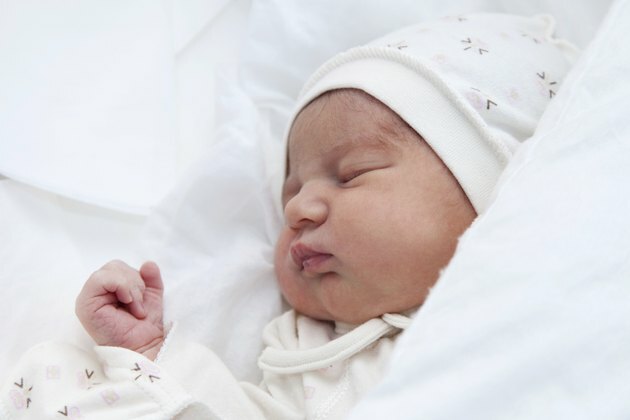 If your newborn is premature, discuss with her pediatrician how to keep her warm. A premature baby will need more layers than a full-term baby to keep warm and may still need to have her head covered. The Baby Book; William Sears, M.D. et. al.